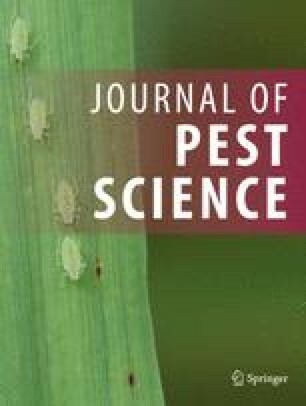 The effect of a fogging system on interactions between Tetranychus urticae and Phytoseiulus persimilis was studied in two cucumber greenhouses in northern Italy. The greenhouses were divided into two compartments, one (referred to as “fog area”) was humidified using a fogging system and the other was not humidified (“no fog area”). Four cultivars were investigated: Akito and Frontera during 2000, Dinero and Jazzer during 2001. Tetranychus urticae was released on a number of plants in both compartments. The release of P. persimilis was planned in both compartments at definite T. urticae thresholds. Phytoseiid releases failed, and the colonization by other predators was scarce.Thus, the effect of the fogging system was evaluated only on T. urticae populations. During the first experimental year, spider mite populations reached low densities in the “fog area” of both cultivars. Higher densities were found in the “no fog area”, especially in late June and early July. One year later, spider mites were more abundant in the “no fog area” of the Dinero cultivar. On the Jazzer cultivar, where most plants were infected by powdery mildew, spider mites were less abundant and differences between the two areas were less marked. Since relative humidity values exceeding 90% (considered as effective on T. urticae) were recorded during the night when the fogging system was not active, we suggest that contact with misty water was the main factor responsible for the reduction of T. urticae populations in the “fog area”. We thank the director and the personnel of the Veneto Agricoltura, Horticultural Experimental Centre ‘Po di Tramontana’, for their support.